Seriously loving these detail shots from Valentino's S/S 11 runway show. A functional and chic strap for carrying around an oversized clutch. Plus, who's going to mess with a girl carrying a studded handle handbag? P.S. Make sure to enter the Shopbop Till You Drop giveaway below & come back tomorrow for another super exciting giveaway from one of my favorite handbag designers! 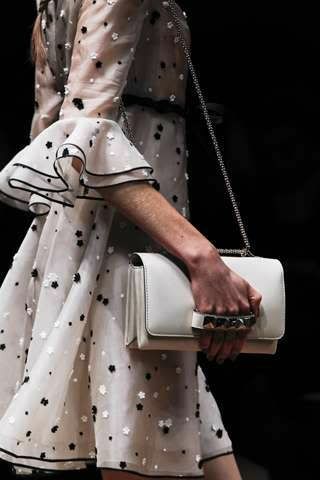 Yes, the clutches are cool... but I'm in love with the snippets of outfits visible in the runway photos! That first dress is absolutely fantastic. && do you have any recommendation on good fashion books? I haven't finished Sugar & Spice yet, after that I am gonna read Style. How do you like it? She looks lovely in the pictures. PS: Love the new banner! yes!! that is nice....I use to hold the handle of my bag....and this seems to be a easier option!!!! OHH those fabrics are beautiful!!! I totally agree with Hannah! That first dress is amazing.